As the first installment in this ongoing “Did You Know?” series, the Beautification Foundation will share a brief history of the Arkansas State Veterans Cemetery in North Little Rock. The Beautification Foundation is honored to be a part of the History of NLR State Veterans Cemetery. 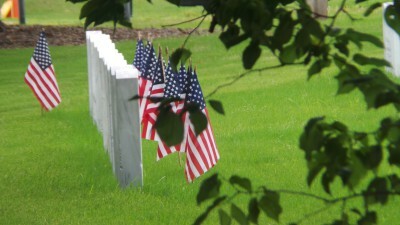 In 1997, the 81st Arkansas General Assembly authorized the establishment of a state veterans cemetery. Then, On Nov. 11, 2001, the Arkansas State Veterans Cemetery was formally dedicated to serving all honorably discharged veterans. The cemetery, situated on an 82-acre site, is located in North Little Rock at 1501 West Maryland Avenue. Our federal government fully funded the award winning design and construction of the cemetery. The Arkansas Department of Veterans Affairs operates the cemetery to commemorate the military service of our deceased veterans. Our cemetery system provides the visiting family and friends an atmosphere of peacefulness and dignity. The staff of the Arkansas State Veterans Cemetery is dedicated to providing an honorable place of rest for veterans; to preserve the dignity, beauty, and serenity of this state-of-the-art facility; and to honor all who sacrificed so much, making possible the freedoms we enjoy every day. The History of NLR State Veterans Cemetery is relatively short, but it has quickly become a hallmark of honor and reverence for our veterans. An integral part of establishing and maintaining a cemetery of this magnitude is the task of landscaping and beautifying the grounds and facilities. This important task has become the responsibility of the Arkansas State Veterans Cemetery Beautification Foundation. The Cemetery Beautification Foundation is dedicated to providing the funds necessary to landscape, beautify, and maintain the splendor of this outstanding facility. The Foundation is now actively seeking volunteers, donations, and pledges that will be used only for the foundation goals. Along with ongoing landscaping and maintenance costs, The Foundation is involved in community outreach programs, special holiday events, and various memorial projects throughout the cemetery. For more Information on ways you can help this cause, visit the “What Can You Do?” page at ARVetCemetery.org. Since the Foundation is a 501(c)3 non-profit corporation, all gifts are tax-deductible to the donor. Please share the History of NLR State Veterans Cemetery with your friends and family, click on the links below to post to your Facebook or Twitter accounts.